The Dentique team is a family, and the foundation of our practice is community. Building relationships with our patients is not an afterthought—it is at the heart of what we do. In today’s healthcare landscape, empathetic and person-centered care can often be eclipsed by advances in technology and provider burnout. For our team, taking the time to get to know our patients is an essential component of our mission to provide the best quality of care to each person who entrusts us with their dental health. Our team cares for one another, so that we can best care for you. We begin building relationships with our new patients by inviting you to a dental office environment that is welcoming, attractive, modern, and clean. Dr. Abes and Dr. Heilpern are passionately committed to state-of-the-art, modernized dentistry and the latest developments in technology and technique. And a patient-centered experience is at the core of who we are! We believe that the doctor-patient relationship is a fixed and unchangeable keystone of care— the pathway for making the best diagnoses, creating the most effective treatment plans, and the means through which healing, support, and satisfaction are experienced. We want you to leave our office with a new perspective about going to the dentist—complete comfort instead of the common anxiety and dread leading up to a visit; no more enduring your time in the dental chair with discomfort or distress. At Dentique, our patients’ experiences are marked by these words: comfortable, enjoyable, friendly, professional, state-of-the-art, pain-free. Our patients leave our office with a sense of accomplishment that they have done something positive— not only for their smile, but also for their overall health. We like to compare it to how you feel after you have finished a good workout—accomplished, positive, confident. Who would have thought you could get those same feelings from a visit to the dentist? At Dentique, we are changing our patients’ perspectives about dental care through exceptional patient experience. We take pride in providing truly satisfying dental care, from the way your appointment makes you feel to the final results that give you a beautiful smile. We believe that the relationship between provider and patient is vital to our ability to address your health holistically and effectively. 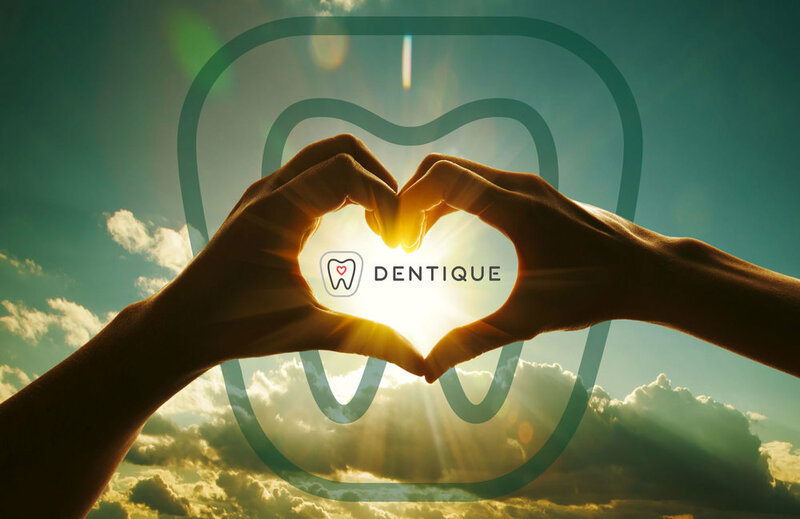 We know that your relationships with our team members at Dentique—built on trust and warm, compassionate care—safeguard your health and help to resolve any issues that could be detrimental if left unaddressed. We are fully committed to your care and to your experience as our patient. Atlanta is our home. We are happy to participate in strengthening the fabric of our community by being a patient-centered practice that earns your trust and confidence and delivers the care you need in the way you want. We believe in total dentistry for total health. Dental care is often a begrudged annual appointment that is avoided at all costs. Our team at Dentique is changing that stereotype, one patient at a time. Many people do not realize how closely oral health is linked to overall health. At Dentique, we want to dispel the idea that experiencing a common fear of the dentist and avoiding dental care is a singular issue, unrelated to your overall health. Skipping your annual cleanings isn’t a big deal. Not getting that persistent toothache or those bothersome mouth sores checked out won’t hurt in the long run... It will resolve itself… It can wait. These ideas, while common, could not be farther from the truth. And here is where our commitment to holistic care sets Dentique apart. We are a practice that focuses on whole-body wellbeing, because oral health means much more than just healthy teeth. A visit to your dentist can be an incredible offensive strategy for identifying underlying health issues. With regular dental screenings, your dentist may be able to identify signs of early dementia, heart issues, diabetes, osteoporosis, and gastroesophageal reflux disease. But most of the time, the best offense is a great defense. Oral healthcare is an essential front-line defenseman for preventing disease. Oral health problems can mobilize to other parts of your body when left untreated. The mouth is an entry point for invading pathogens and toxins that cause localized effects but can also spread to other parts of the body. Heart and lung diseases, autoimmune diseases, diabetes, and even adverse pregnancy outcomes are all linked to untreated dental issues, particularly periodontal disease. Periodontal disease is the inflammation or infection of the gums that surround your teeth. At worst, gum disease can result in tooth loss and the spread of harmful bacteria to other body systems. As bacteria enters your mouth and naturally combines with mucous and other particles, it forms a sticky, colorless plaque on your teeth. Plaque that is not removed by regular brushing and flossing hardens and forms tartar, which can only be removed by dental professionals! The longer plaque and tartar remain on your teeth, the more harmful they become. Gingivitis develops first, when the bacteria cause your gums to become inflamed. Many Americans experience gingivitis, when the gums become swollen and red and bleed easily. Gingivitis is mild and can typically be reversed with daily brushing and flossing, and regular visits to your dentist for cleanings. However, when gingivitis is not treated, it can advance to periodontitis. Periodontitis causes the gums to pull away from the teeth and form spaces called “pockets” that become infected. As the infected pockets allow plaque to spread below the gum line, your body’s immune system reacts to fight the invading bacteria. The combination of this natural immune response and the entering of bacterial toxins below the gum line causes a breakdown of the connective tissue and bone that hold your teeth in place. If periodontitis is not treated, the bones, gums, and tissue that support your teeth are destroyed. Eventually, your teeth become loose and must be removed, and it is possible that the spread of bacteria within your body will have contributed to another significant health issue. Oral health and general health are inseparable. Dr. Abes and Dr. Heilpern provide education and treatment that is integral to the overall health of their patients. Another aspect of whole-body wellbeing is the mental, emotional, and social impacts of oral healthcare. Although it is not often openly discussed, dental health and hygiene are highly valued in our culture and directly affect quality of life. People with untreated oral conditions often suffer in silence as their lives are affected— the erosion of confidence to participate fully in social interactions; the hindrance to building intimate relationships; even the interference of basic daily communication with others or the willingness to smile. The impacts on quality of life should not be understated or ignored. At Dentique, our patients know that they can experience life with a beautiful, healthy smile. Our dentists professionally assess each patient and create an effective treatment plan to achieve your desired results. There are many options available for cosmetic dentistry, orthodontic correction, and restorative dental work. Our team at Dentique will care for the whole you, all the time. Our patients truly love us, and our commitment to comfortable, exceptional care. Choosing the right oral healthcare provider matters. Not only is there the “people connection” – choosing a team for your dental care that you connect with and trust – but there is also the practical need of receiving exceptional oral healthcare. The tools, methods, and technology that a dental practice utilizes matter. So does the “feel” of your dental office. These components of your visit will either add to your stress or set you at ease. You need to be comfortable, anxiety-free, and confident when you visit your dentist. Knowing the importance of preventing periodontal disease, your oral healthcare provider needs to be on the cutting-edge of modern and safe dental care, using treatment options with proven efficacy, in an atmosphere that is warm and inviting. Too much to ask? Not at Dentique! Our mission to provide you with outstanding care begins the moment you step foot into our office. The Dentique environment is a top priority for our practice, and our office has been designed with intention to make your visit as smooth and enjoyable as possible. When you enter Dentique, the contemporary, clean lines of our space and select amenities available to our patients set the tone for your visit. The interior of our office and our state-of-the-art amenities were designed to enhance patient comfort from start to finish. Free valet parking is available for all patients visiting our office. We have installed televisions in the ceilings above our dental chairs so that you can catch up on the latest entertainment while you are getting your dental work done, or you can use our USB hookups to listen to the music of your choice during your treatment. For patients with significant anxiety, we have relaxation gas available upon request. Our commitment to professional excellence, and to your comfort, distinguishes us as the best dental provider in Atlanta. At Dentique, we dynamically pursue a culture of excellence, always seeking to grow as professionals and as outstanding providers. We stay current with the latest in research and the best ways to apply solid findings to our work for the benefit of our patients. We use CBCT (cone beam computed tomography) imaging for our in-office X-rays to make your dental scans easy and thorough—no bite wings placed in your mouth! CBCT imaging allows for comfortable imaging, better diagnosis, and improved outcomes. 3D X-ray technology lets us view your teeth in three dimensions to better diagnose trouble spots and create the best treatment plan. We have an in-office water filtration system that provides superior high-purity water for all our dental procedures. Our commitment to excellence translates to comfort for our patients. We can’t wait to welcome you to our practice and provide you with an exceptional experience that changes how you view going to the dentist. Schedule your appointment today and find the forever dentist you have been hoping for, at Dentique!